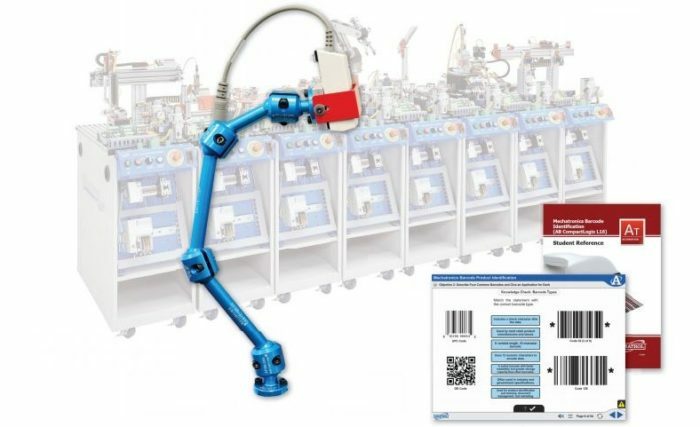 Amatrol’s Mechatronics Barcode Identification Learning System (87-BR1S7300) teaches learners how barcode readers are used within an automated line to identify components, enter serial numbers in a database, and sort items into groups. This learning system allows learners to practice real-world, hands-on skills such as operating a PLC project that uses comparison instructions with a barcode part identification system and configuring and interfacing a barcode reader for serial communications. Barcode identification systems are used in real-world applications such as identifying and quantifying inventory in warehouses and shipping centers, sorting and tracking mail, and sorting baggage at airports. The Mechatronics Barcode Identification Learning System is used in conjunction with select Amatrol Mechatronics Stations integrated with Siemens S7-300 programmable logic controllers (PLC). The 87-BR1S7300 scans barcodes on parts traveling through Amatrol’s mechatronics line and signals a PLC to perform various tasks such as sorting, assembly, and inventory. Used individually with stations 4 or 7 or with a combination of stations 3 and 5 featuring Siemens S7-300 processors, the Barcode Identification Learning System allows learners to practice real-world barcode/automation skills, such as: signaling the correct spool to use in assembly; reading parts on a rotary table; and using a reader to sort parts into four different bins based on material. These skills facilitate a demonstration of flexible manufacturing by allowing the system to recognize a part based on the barcode and alter the automated operation accordingly. The Barcode Identification Learning System features real-world components, which allow learners to build skills that translate to actual applications needed by industrial and manufacturing employers. This learning system includes: a barcode reader; a reader mounting fixture, which can be affixed to any station and features a flexible arm; RS-232 module for Siemens S7-300 series PLC with cabling; barcode printing software; and adhesive labels. Amatrol’s world-class curriculum places equal emphasis on theoretical knowledge and hands-on skills so learners understand the purpose of each step and action. This reinforcement ingrains industrial concepts and skills into a learner’s mind and makes it easier to build to more advanced topics. With stunning depth and breadth, this learning system covers barcode function, maximizing barcode scan accuracy, serial communications, PLC string data, programming and interfacing PLCs to serial communication devices, configuring and interfacing a barcode reader, and operating a PLC project. This system’s curriculum is presented in a stunning interactive multimedia format featuring 3D animations, graphics, text with audio voiceovers, and much more!